Founded in 1995 by Dr. Henry Meredith, the PFBB is patterned after the British-style brass bands which are seeing a revival throughout North America. The ensemble is based in LONDON, ONTARIO and performs regularly in the London area, and occasionally in various southwestern Ontario centres. The ages of PFBB members span more than 50 years, and a few performers travel from as far away as Sarnia, Toronto, and even Belleville, Ontario to participate regularly in the ensemble. Some of Canada’s finest professional and amateur musicians, as well as guest artists from New York, Michigan, and Indiana have joined its ranks to play the traditional instruments that create its unique sound. 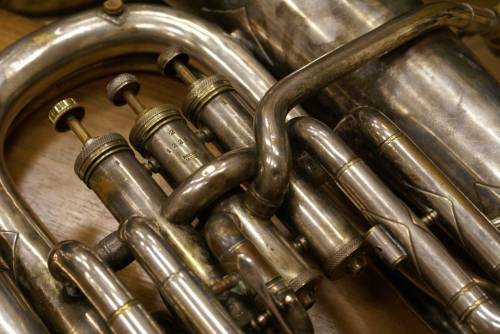 Several of these brass instruments, plus any historical brass required for period performances, are provided from Henry Meredith’s renowned and extensive collection. Dubbed “The Plumbing Factory” by visitors to Meredith’s basement “museum,” his collection of over 3300 instruments is perhaps the largest private collection of musical instruments on the continent. Both London City Life Magazine and the Toronto Star recently profiled the Henry Meredith Collection. As a result of those publications, and of televison appearances (on such programs as “Canada a.m.”), Henry received a call from the producers and props department of Disney’s revival of Meredith Willson’s “The Music Man” and was subsequently hired to provide all the historical band instruments from the 1912 era in which the story takes place, and to serve on location as Period Instrument Consultant. The made-for-TV movie, starring Matthew Broderick and Victor Garber, aired on the Wonderful World of Disney in February 2003 and is now available on DVD.